This was a dish I made while I was in France…since my dad was in the hospital, my mom and I just cooked simple meals because by 1pm we needed to be at the hospital. Tagines are wonderful if you don’t have to much time to eat but still want to enjoy a healthy and flavorful meal. Clay pot cooking is one of my favorites, and as soon as you try it, you will have a difficult time going back to a regular-pan cooking. It preserves all the aromas of each ingredient and infuses all the flavors together. Like in papillotes, you can cook anything you like in tagines, just be creative, with a little audacity, and you’ll get a fabulous dish. A couple of years ago, it was not as easy to find a tagine claypot, but nowadays, most stores carry them (at least in California); tagines are becoming more trendy, simply because it has traveled outside borders and everyone has discovered their health benefits, and still keeping amazing aromas. I have seen many types of couscous in France (in France we call the actual grain semoule, couscous being the Algerian dish, made with vegetables, meat and semoule) different kinds of whole grains, such as kamut, quinoa, spelt, etc…since my mom had diabetes, I tried to make dishes that were good for her, or at least that did not aggravate her diabetes. This quinoa couscous is a perfect grain to go with any tagine. Of course people who don’t like squid can use other ingredients such as shrimps, or white fish. I kept the couscous simple with no major strong flavors, to really enjoy the tagine broth, couscous being a minor addition in this meal, necessary but secondary. Heat olive oil in tagine and brown the onions. Add leeks and cook for about 5 minutes. Add squid, and all other ingredients except for the fava beans. Mix all ingredients well. Bring a pot of water to a boil, and cook fava beans for three minutes. Remove from heat, drain and peel fava beans. 10 minutes before end of cooking time, add fava beans to the tagine, cover and let it cook for another 10 minutes. Sprinkle with fennel leaves or mint and serve with couscous. Proceed like for a regular wheat couscous. Bring vegetable broth to a boil. Coat couscous with olive oil using your fingers. Add broth to the couscous, cover and let it sit for about 10 minutes. Using a fork, separate the grains, add lemon juice and cracked pepper. Adjust with salt if necessary. For broth quantity, I cover the couscous with 5mm of extra broth above couscous. This entry was posted by silvia on March 22, 2011 at 4:11 am, and is filed under Fish/Seafood. Follow any responses to this post through RSS 2.0.You can leave a response or trackback from your own site. Wonderful recipe! When you say quinoa semolina do you imply a special variation of quinoa or does it mean that both quinoa and semolina would work? Quelle belle tagine. Je n’ai toujours pas essayé la seiche… Je sais il le faudrait. En plus, tu as quand même quelques recettes qui en contiennent! This is an amazing dish. so full of flavour. A tangine is definitely on my wish list!!! You’re so right about clay pot cooking – flavors just pop and sing. 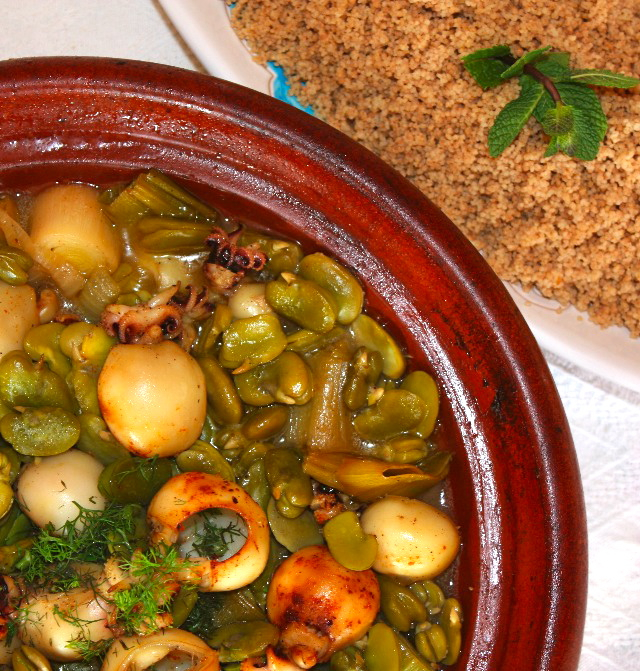 This tagine is wonderful – the leeks must add that perfect wow. What a beautiful dish. It screams comfort! I cook in my clay pot very often and the flavors are absolutely amazing. Now I’ve got to buy a tagine, just to make this fabulous dish. Simple but delicious, my kind of food! I rally should cook with squid more often. It’s something I don’t generally think about, but this looks superb. This is a very nice recipe, look forward to trying. Really looks exotic with all the squid. This isn’t something I would typically eat, but it looks so good that I need to rethink that. At first I was only familiar with Moroccan tagines, but not after I learned making different clay pot recipes with my terracotta that has combined lots and lots of deliciousness and healthiness in my food. 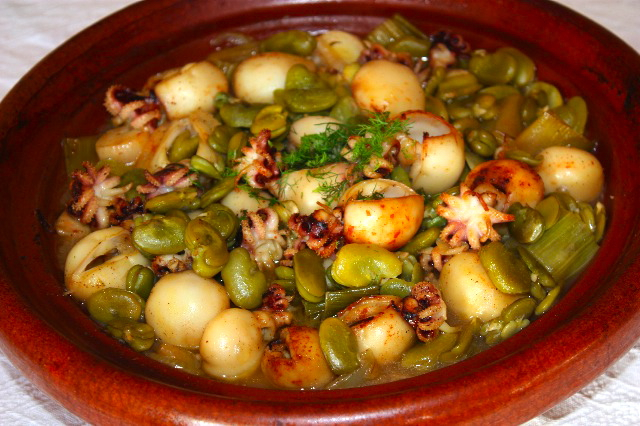 This Ocean Tagine is worth a TRY! I’ll start! Thanks for sharing.